I am about to give you a recipe that is so delicious but yet sounds so utterly horrifying, I am sure you are going to give me every weird eyeball, nose crinkle, and mouth wrinkle face there is. Sounds GREAT ALREADY, DOESN'T IT? Actually, a lot of you won't think it's that crazy, but at first glance it seems like an odd pairing. I came up with this crazy sauce one day when I had a craving for chocolate but wanted to restrain myself a little bit and not go bonkers on the homemade magic shell (that would be melted coconut oil with chocolate chips - pour it over ice cream and it hardens...consider this as your warning if you plan on trying it - you will eat the entire batch. In fact, sometimes I just want to eat that hardened magic shell so much that I get this pathetic tiny scoop of ice cream - a 1 tbsp. kind of tiny - and repeatedly pour magic shell on it over and over again to get that wonderous chocolate magicness. ), especially since I think it was something like 10:30 in the morning. So I thought I'd make myself a smoothie and add some cocoa powder or something into it to see if I could get my fix. I have to say, it was quite a hit. I struck upon a wonder. Eureka! Even the littles begged for more. Here's the gluten-free, dairy-free, good fat filled, potassium, magnesium and omega-3 rich, healthy amazeballs dealie: with your blender, mix a ripe banana, half of an avocado, golden ground flax seed, a scoop of cocoa powder and some water. The avocado thing initially sounds weird, but that crazy little avocado makes your smoothie as smooth as pudding. It is so creamy soft delish, you won't believe it. Now if your avocado has turned to stink with black spots on it, don't use it. It will funktify your wonder and make it putrid. 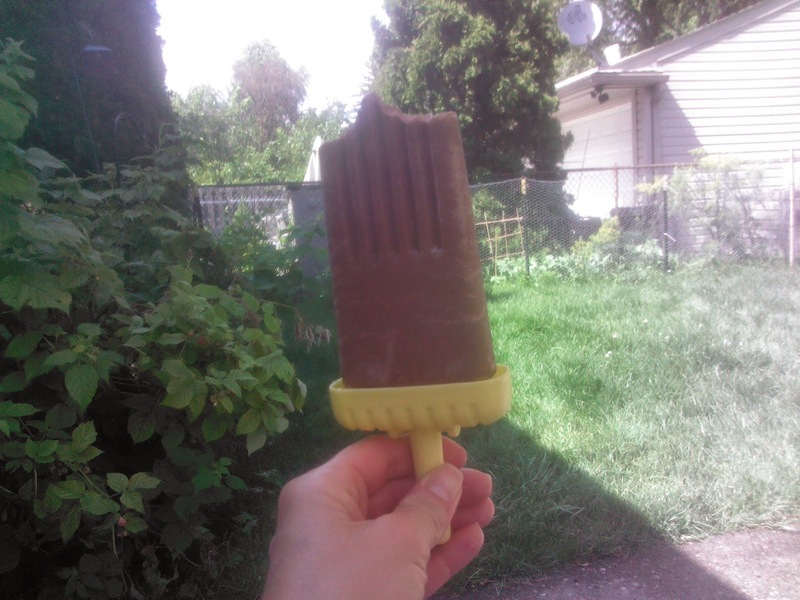 Bonus: If you want to pretend what you're doing is even more delicious, you can freeze it in a mold (unfortch mine is plastic - yuck) and make yourself some pudding pops. I just ate one. It was amazing. Peace, love and take that, Skinny Cow!